I adore this module inside and out. On the outward side, it was Angus McBride's first and best cover piece, spotlighting a bleak culture in an amazing freeze-frame. The Rohirrim are the closest to the Anglo-Saxons or even Norse in Tolkien's world, courageous yet hopeless, "riding to ruin" to embrace that Ragnarok-like annihilation of all that is good. The long defeat runs in their blood, and in this sense they share more in common with the seers and rangers of Arthedain than most would think possible. But where the northern Dunedain are resigned to it, the horse-lords seem to thrive on it. It's as if their history of repeated migrations and awful-odds warfare forged a culture of exultant fatalism, and Peter Jackson nailed this perfectly at Dunharrow, when Theoden calmly tells his men they can't possibly prevail against Mordor's armies: "But we will meet them in battle nonetheless." That's three millennia of the long defeat talking, and I could practically hear Vidugavia and Fram being channelled from the great beyond. 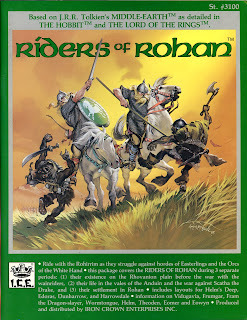 Meaning, indeed, that Riders of Rohan covers more than indicated by its title. It chronicles the complete history of the horse-lords in their three stages: the Eothraim years of 1-1856 (Southern Rhovanion), the Eotheod era of 1856-2510 (the Anduin valley), and the Rohirric time of 2510+ (Rohan). This makes the module exceptionally easily to use anytime in the Third Age. Players can throw themselves into the Wainrider Wars, go against the Balchoth Confederacy, or bare their teeth against the Long Winter after the slaying of Wulf. It's comprehensive in the way more ICE modules should have been; I'll never understand the heavy reliance on a 1640 default setting. The personalities of famous huithyns like Vidugavia and Marhwini, althegns like Fram and Eorl, and kings like Helm Hammerhand and Theoden are provided, and it's easy to see how the original six tribes became increasingly centralized to embrace a monarchy. Their foes -- whether the Sagath and Logath chariot-riders, the barbarically matriarchal Asdriags, or the Dunlendings -- are the stuff of Bronze-Age barbarity; Rohan's unity was forged in its fires. I particularly like the breakdown of the six Eothraim tribes (totaling 38 clans), and how their ambiguous social order seems benign by Easterling standards but grim compared to other Northman cultures. This work-out complements the Eothraim material in Southern Mirkwood perfectly, without wasteful redundancies. The mapwork gets a pass but certainly doesn't shine, another reminder of Rangers of the North. That being said, there's some good stuff here, notably Helm's Deep, which is more fine-tuned than Aglarond in the Isengard module. There is also the Juggler's Hall, a shadowy bardic school of "noble" smuggling and other roguish activities. 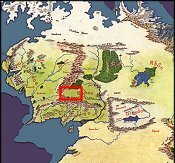 The capital-towns of Framsburg and Edoras are presented for the Eotheod and Rohirric years (Buhr Widu for the Eothraim period was covered in Southern Mirkwood), and Druadan Forest is also showcased with a Wose village and circle of standing stones. The Wain-town of Ilanin is covered, inhabited by mostly Sagath, the closest Easterling outpost to the Eothraim. Finally, the two-page centerfold details the Deeping Coomb, a close-up geographical of the Helm's Deep area and Juggler's Close a few miles south. For my money though, you could almost scrap all of this and still be left with an awesome product. Riders exudes so much resonant culture that it leaves me burning to ride to ruin myself.